A mechanism which helps to identify flow and erroneous code. Traceability of the entire code base to re-engineer any execution path. Identify threats in design from the trace. To achieve the purpose, following are design problems. 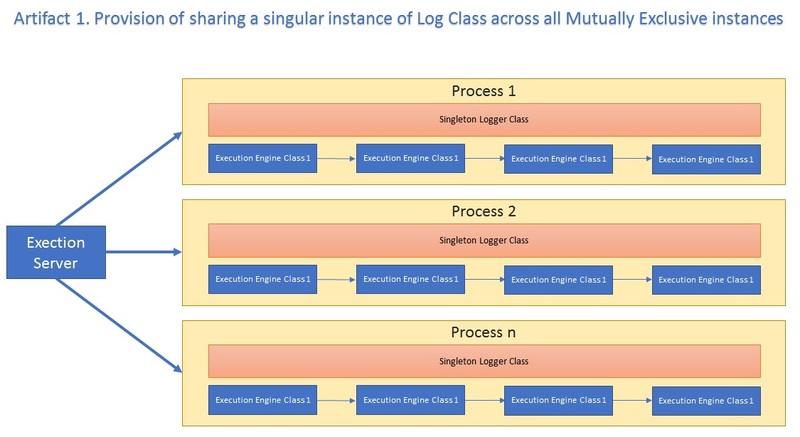 Provision of sharing a singular instance of Log Class across all Mutually Exclusive instances. Provide a solution for unique instance per singular instance of Log class per execution thread. 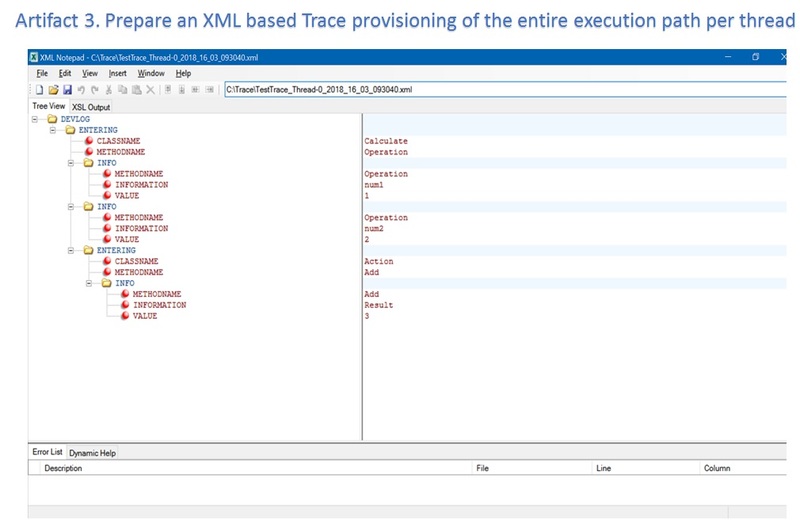 Prepare an XML based Trace provisioning of the entire execution path. Solution: Singleton design pattern can provide singular instance of a class across the entire execution per process. Solution: A thread specific reentrant mechanism is excogitated to fetch singular instance of the Log class for a specific thread. Thus, each concurrent thread under execution will consume unique instance of the singular (Singleton) class – Hack the Singleton. Solution: All the entries and exits along with errors, warnings and exception etc. will be logged in hierarchical structure per execution per thread. Prepare a singleton class that serves as a singular interface for trace mechanism for all the ME classes – Logger Class. Provide single wrapper for all Tracing activities, one method to set the trace level and one method to get the Logger class instance. Tree structure is leveraged out of the entire execution path using XML concept. Given a code scenario where code flow is sequential rather than hierarchical which involves many independent classes and each class is ME; introducing Trace mechanism into it will generally indicate Singleton Design pattern for the Logger class. But what if the execution of the code happens in a multithreaded environment which is Asynchronous. Now the problem statement completely changes from “Singular instance per execution process for all the class instances to Singular instance per execution per thread for all the class instances”. To tackle this design challenge, it is required to hack the singleton design pattern such that per threaded execution singleton class releases one instance (of course when requested) per thread and not for the entire process and make it believe that the subsequent requested instances are from a different process. In this way, 2 problems are tackled – 1. Only a single instance of the Logger class is available across all the execution classes involved and this helps to avoid passing the Logger object along with each method call (not an ideal code design) and 2. when a different thread request for Logger singleton instance it does not return the same instance that is already in use (otherwise the data corruption takes place because asynchronous thread will over write the Logger instance containing information of another parallel thread). //Check for the second time to prevent race condition. But this implementation only helps us address “Artifact 1. Provision of sharing a singular instance of Log Class across all Mutually Exclusive instances”. But the solution to “Artifact 2. Provide a solution for unique instance per singular instance of Log class per execution thread” needs a tweaking in the singleton class by which it not only retains Singleton property but also serves the purpose of thread specific Singleton. The below mentioned code helps achieve this purpose. The new implementation of a singleton class for Asynchronous multi threaded scenario to tackle Artifact 2. 1. 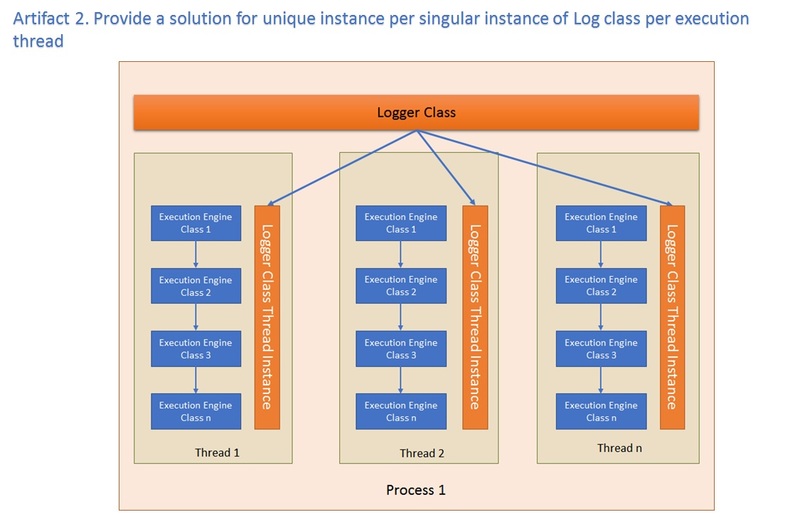 Logger.java: This class provides a singular instance of the Logger class per thread. This method gets an instance (singular) of the Logger class per thread. This method sets the level of tracing required to get clarity on execution flow. 4 levels are currently being exposed viz. 1, 2 and 3. 0 to turn off tracing. This single method helps introducing trace in between the code to be put under the scanner. This method helps to get the buffer which would reflect the entire flow of code execution.This should be requested just before the point where the execution of code ends. 2. Calculate.java: This is just a dummy class to demonstrate the usage of Logger class. 3. Action.java is again a dummy code which is ME class but Calculate.java uses this to carry out the actual calculation. The methods in this class is again invoked using an asynchronous mechanism. 4. ThreadClass.java is a dummy class which is used to invoke an object of Calculate.java on different methods exposed by that class across multiple threads. * <br> To be used along with traceLog method for ENTER trace in methods. * <br> To be used along with traceLog method for LEAVE trace in methods. * <br> To be used along with traceLog method for INFO trace in methods. * <br> To be used along with traceLog method for ERROR trace in methods. * <br> To be used along with traceLog method for DEBUG trace in methods. * <br> To be used along with traceLog method for WARNING trace in methods. * <br><b> createLoggerInstance :</b> returns singleton instance for Logger class per execution per thread. * <br><b> setTraceLevel :</b> set Trace Level. * <br><b> 0 : </b> NO Trace. * <br><b> 1 : </b> ENTER, LEAVE and INFO trace. * <br><b> 2 : </b> ERROR Trace plus LEVEL1 traces. * <br><b> 3 : </b> WARNING, DEBUG plus LEVEL2 traces. * getTraceLevel: returns trace level set by external source using setTraceLevel(). * traceEnter: returns string buffer with class name and method ENTERED. * traceLeave: returns string buffer with closing XML tag when EXITING a method. * traceInfo: returns string buffer with INFO details inside the methods. * traceError: returns string buffer with ERROR details inside the methods. * traceDebug: returns string buffer with DEBUG details inside the methods. * traceWarning: returns string buffer with WARNING details inside the methods. * <br><b> traceLog :</b> This method to be used to set the trace lines inside methods. * <br> <b>uTraceMethod :</b> int type. Denotes the trace methods (ENTER, LEAVE, INFO, ERROR, DEBUG, WARNING) user wants to invoke. * <br> <b>sBufferArg1 :</b> String type. Denotes the Class name or Method name. * <br> <b>oVal :</b> Object type. Denotes the Method name or variable name or variable value. With Asynchronous Singleton implementation, Artifact 1 and Artifact 2 got addressed. Artifact 3. (Prepare an XML based Trace provisioning of the entire execution path per thread) is addressed leveraging the call stack mechanism. With all the artifacts being addressed, the Tracing mechanism for a multi-threaded environment is successfully implemented.